My Stockinette Stitch adventure started out well. I made a 30 stitch Cast On and proceeded to alternate Knit Stitches and Purl Stitches for over a dozen rows. It was now time to show my work to my avid knitter wife, my teacher, for her review and critique. After looking at and pulling on my work, she nodded her head in approval and told me to knit three inches and show it to her again. I continued making my Stockinette Stitch. 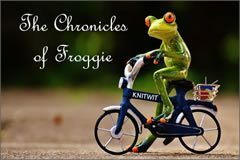 At this point in the story, I should mention that the TV was on and my avid knitter wife was watching, A Royal Christmas, one of those schmaltzy Hallmark Channel Christmas movies. Normally I can ignore those movies and go about my business, but this one was hard to tune out. You see, the devoted butler to the Prince stole the show helping the Prince’s young American love interest (Lacey Chabert) develop the social manners needed to please the queen (Jane Seymour). Well, as it turns out, I should have paid more attention to my knitting. After knitting three inches and showing my work to my wife, I could tell by her furrowed eyebrows that there was something not quite right with my Stockinette Stitch. After more study than usual, my wife then explained and showed me the errors I had made. Basically, I made two kinds of errors. The first kind of error that I made was in my Purling. Not always, but quite often, in my row of Purl Stitches, I would somehow have Knit Stitches show up in the row. Sometimes it would be just one Knit Stitch in the row and other times it would be several. I did this quite a lot and in fact, very few of my Purl Stitch rows were only Purl Stitches. The second kind of error that I made was in alternating my knit and purl rows. 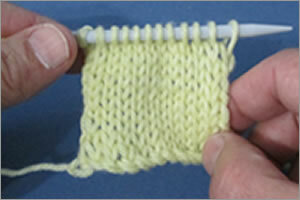 More than once, I would knit two rows of Knit Stitches before alternating to the Purl Stitch. Needless to say, my Stockinette Stitch did not have the look of small Vs nor the appearance of a smooth side of knitting. Having been here before, I frogged my work and started over, this time with a real commitment to paying attention. As I began and continued with my Stockinette Stitch, I stayed intensely focused on my knitting. I really wanted to make it through three inches of knitting with no mistakes and it helped that the Hallmark Christmas movie was over. Perhaps on account of paying better attention to detail, I noticed that whenever I was making my row of Knit Stitches that the work in front of me looked as if the stitches were pointing down and generally smooth in appearance. And when I was making my row of Purl Stitches, the work in front of me looked as if the stitches were pointing across and quite bumpy in appearance. I went on with my Stockinette Stitch knitting, looking at my work while saying to myself, “if smooth knit, if bumpy purl.” I finished my three inches of knitting and showed my work to my avid knitter wife. This time, rather then furrowed eyebrows, she had a big smile. Success. I should have left things there. My Stockinette Stitch was pretty good. My wife had a smile on her face. And I was ready for a treat, a small piece of apple pie. But no, I had to make the point that in addition to the one instruction that my Knitting Made Easy book provided for making a Stockinette Stitch (alternate knit and purl rows), it would have been nice if just a smidgen of beginner knitter advice had been provided for (1) what the Stockinette Stitch is supposed to look like, (2) how to always know when you need to make a Knit Stitch or a Purl Stitch, and (3) what the Stockinette Stitch mistakes are that beginners often make and how they can be avoided. My wife was still smiling, but shaking her head. Right then, I decided to stop criticizing my Knitting Made Easy book and to have a bigger piece of pie.